After a hectic weekend sorting out stuff, finally went up to the Allot between showers and picked a few courgettes. Also rescued a couple of the garlics from drying in the framebox, and ate a handful of ripe raspberries. Yum. Very nice ones, I am glad I got Glen Ample… I just hope that a few more of the canes grow new ones as so far I've only got about half of them growing. Sweetcorn now looking a lot better, both the small ones and the big ones. And the leeks are doing fantastically now. The verinas are growing stems now and the musselburghs are going to be pullable in 6 weeks. Also picked a large gooseberry to test them, and I think a big pick is soon going to be in order, before they start splitting as they are definitely nearly ripe now. Went up to pick gooseberries with the small strawberry punnet and realised quite fast how inadequate it was. I needed the trug badly! Had a fantastic surprise as far as the rejuvenated gooseberries were concerned - they are dessert berries and just starting to turn red! Picked a punnet of the green ones, then a 2l drinks bottle of them and then half a bottle of blackcurrants and red goosegogs. Pigeons have been feasting on the currants this year - not as many by far. Pulled what is probably the last rhubarb for this year. Picked a small handful of astonishingly large raspberries and staggered home. One raspberry was over an inch in diameter. Spent the evening bottling the green gooseberries, so I now have quite a lot of instant pies. Up to the allotment with the French bean seedlings (all not many of them) and the remaining marrow plants. Stuffed them all in and then weeded the beetroot. Weeds have gone absolutely nuts in the past two weeks, and it's going to take a week or so to get the beds clear again after it's stopped raining so hard. 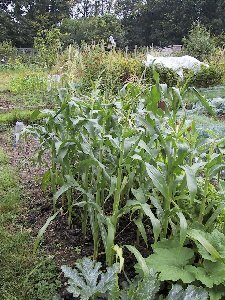 Glad I mulched the sweetcorn with the manure - it's thickened up a lot and getting ready to start the main growth I think. Decided the garlic was about ready, as all the foliage is now yellow, and dug up some quite large bulbs given how small they were a few weeks ago. Only one was a mono clove. Pulled a few spring onions too, and cut another massive lettuce. Then went on to the gooseberries again and picked well over 4lbs again, plus another handful or so of the dessert ones. And I was only picking the berries that were underneath the bushes and not easy to get to. Still loads left. Jim wandered up and gave me a huge bunch of sweet peas - wonderful (and nice to know someone who gives me flowers!). Tied some twine between the posts at the top of the plot and tied in the new growth blackberry briars. 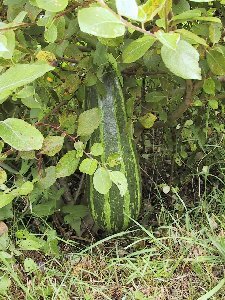 They are very thick ones, and so next year should have some good fruit. If this year the plants don't fall over under the strain. And there are a few brand new blackcurrant stems too, so that should make some of the pruning easier. 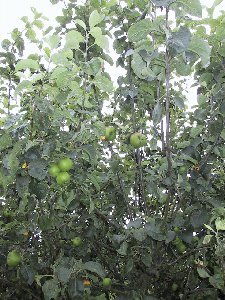 Apples are growing fast and prolifically. Finally staggered home after having filled the trug with fruit and veg and flowers. Popped up to the allotment to have a look round and hoe a few things, so it didn't look too bad tomorrow. Pulled up the three seemingly-large carrots out of the bottom plot and found that two were slugged to bits and the third was forked just below the top. Sigh. Sowed radishes in a third of the plot. Planted another load of French Beans, sowing a pair of seeds per station, in yet another attempt to get them going. And cut a teacup-sized cauli, before the silly thing bolted. Mum and Dad down for the day, and what a lovely day. Too hot, if anything. Went out for lunch and then groaned our way back to the house. Left P behind and went up to the allotment armed with trugs and gloves and spent an hour or so picking gooseberries. All of us ended up scratched to blazes but the grand total was 15lbs 13oz of both green and red, the last few sticks of rhubarb and I managed to get the rest of the modular onion sets planted too, in the rest of the bottom carrot plot. They had a decent amount of leaf, so should get cracking to compensate for the useless onions in the top plot. So now I have most of the beds filled. Cut the first cabbage, and two more lettuces. Allotment meeting today. They are still banging on about getting more people interested, and the self-management lark. Then say they'll advertise the allotments in The Grower.. well no wonder they don't get any response - you only get The Grower when you have got one already! Silly people. But did learn a fair bit about exhibiting produce, and how utterly obsessed some folk are. Makes me look sane. One good thing that did come out of it was getting Chris and Maggie to give me their email addresses, so we should be able to gradually acquire people and keep them up to date on the goings on at our site. Went back and actually sat in the garden with a drink, looking at it. Still reasonably warm, so had to go and water the allotment. Took the shears with me and cut 2/3 of the paths while I was there. Apart from the autumn onions, the place is looking pretty good. 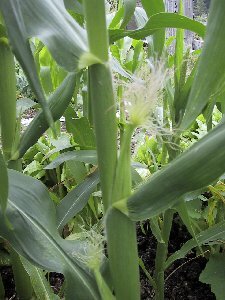 Sweetcorn are starting to grow tassels out of their tops, have thickened up a lot and are getting ready to grow upwards. The full-sized cob plants are doing well also, having almost caught up with the minipop conservatory ones in height. Watered the as-usual baked French beans, and the patch where I scattered radish seed. Hopefully one lot will germinate soon. Gorgeous day. Spent most of it out and about, though the exhaust dropping off the car wasn't quite what I'd expected! I did however crumble to buying a redcurrant and a new ‘Blue Jay' blueberry at the nursery. Put them in the back garden, repotting the redcurrant first as it's going to be a while before I dig out the blackcurrants and tidy up the orchard. I'm going to be ruthless later this year - any bushes that have grown new canes can stay, any others adios, since they did nothing. Decided to have a barbie and so did all the allotment watering at top speed in early evening. The French beans are germinating! Hopefully they'll not shrivel, but I did sow two per station (*now* I get the 100% germination rate!) and so there's redundancy. Planted a bush marrow (I know, but it was only 50p!). Cloudy and occasionally quite darkly overcast but no rain. Went out to the allotment and spent a few hours there weeding. Pulled two carrots (wow) and noted that a lot of little ones are now growing. At last. Sowed a bit more seed in the gaps (I'm being optimistic). I think that plot is the Nantes Frubund, so late sowing is ideal. The radishes are coming up, and the French beans now have little pairs of leaves. Better late than never. The Berggold ones that grew a month ago from my saved seed are just about to flower! 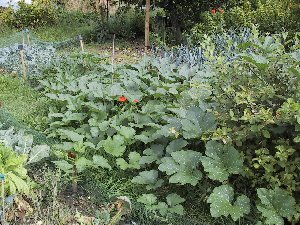 Well at least I'll have a staggered crop… There are a few courgettes setting, and the two Gold Rush plants are on the verge of the marrow explosion. One of the trailers (a long green) is wandering off up the bed happily, so I expect it will start fruiting soon. The custard marrow has finally got visible females - tiny little balls, much harder to spot than the normal ones. I hope I get some of the round courgettes from Lee's plants, too. 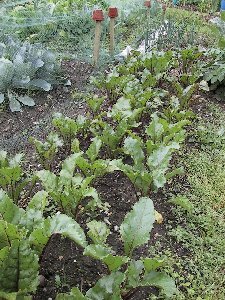 Cut some caulis before they skyrocketed, then got stuck in to weeding the broccoli. Seems to be a seed bed for foxgloves, so transplanted several of them to the middle of each group of broccoli to grow for next year. Picked a few more gooseberries - there are still quite a lot left - and the first blackberries too. I wonder what one can do with dozens of little apples? The modular onions are doing well, now. Hopefully they'll grow reasonably large in the time left to the summer. If I keep them watered they should. Up to A to do watering, as rain not due until tomorrow. Beans still happily growing. Two more marrow/courgette plants have got open females, so here's hoping. Most of the open females are on the courgette bushes though - the trailers get going a bit later, and the females tend to be on the trailing tip. Picked another handful of raspberries, and got given another large bunch of sweet peas by Jim. He grows them to show, which accounts for the astonishing colour range. Lee appeared for the first time in ages. He now has the new baby, a boy, so was looking rather shattered! Gave me a few carrots. Watering on the run again, en route to collect a takeaway! Chucked water on everything - and noticed quite a few courgettes are now growing very nicely. And the first real marrow (the trailer) is going to be open any day! I have got several radishes with second leaves on now. Horribly hot today. Went up to water stuff and did everything, on the grounds that it was needed. Picked the first cucumber - have several ripening at the same time. Didn't go to water until after church, when it finally started to cool down a bit. Three female yellow courgettes are going to open tomorrow! And the real marrow is now off and running. Must keep it well watered! Noticed some silks peeping out from the sweetcorn so picked one. Tiny! 2½" cob, so not quite as big as I would like it to be yet. Very very sweet tasting though! Even hotter and muggier - and of course this meant a whopping storm. It arrived as I got to the allotments straight from work - I'd thought on driving up the hill I'd seen a fork of lightning, but wasn't sure, and storms usually take ages to get to overhead. Wrong! 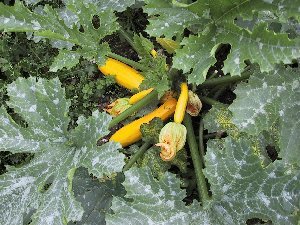 Walking to the plot I heard thunder, and as I started to investigate pollinating the courgettes the rain started. I ran for it, and by the time I got to the house there were cm-sized hailstones. Got rather wet. Picked four courgettes, two yellow and two green. Unfortunately I really should have got the other yellow one yesterday, but the storm had got in the way. It's now shot up in size the way only cucurbits can, so I have a yellow marrow on the way! Everything is mud-spattered thanks to the force with which the storm rain and cm-sized hailstones hit the ground. The module onions are growing rapidly, or at least the first lot I planted out are. Leaves are increasing in number and the bulbs are already an inch across in most cases. The second lot are rather more battered, but should at least give me some pickling onions! Took photos, as it was about time I did! Gold rush courgettes: very prolific! Lots more rain. No need to go to water anything! Did manage to sow a module tray of baby turnips during a dry bit, which should take 8-10 weeks to get to maturity (golf ball size, and colour for that matter). 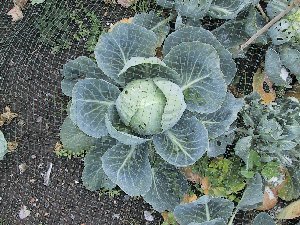 Must do likewise for the spring cabbages. I'll shove the turnips in the autumn onion patch, as no way are the silly things going to get any bigger.